Jack Kenny was so intrigued by the music of Kadri Voorand from Estonia, heard as part of the London Jazz Festival, that he wanted to know more about the unique artist. Can you tell us about your recent album? We just love doing music, it is all about feeling and having fun for us. The main thing is to transfer emotion and energy to the listener. The latest "Armupurjus" - "Love Intoxication" was recorded in Italy, in Emme Producioni studios. This album is full of freedom. I guess I found myself in no-limit feeling. The whole band just did whatever we felt like doing. We played composed pieces, as well as free-improvised new ones, not deciding any stylistical direction. The audience mostly does not understand which is which, because we sense each others ideas already so strongly. So, the songs called "Improludes" are actually cut-outs from one-hour long songs, which we recorded each night at the end of our studio day. I was born into a family of folk musicians, since as far as I can remember, I was singing, playing and dancing in an Estonian trad. folk ensemble, which was led by my mom. We performed authentic Estonian folk music. So since early childhood (2-3y. ), nordic runo singing surrounded me and the improvisational way of that kind of singing and telling stories has probably influenced me very strongly. In school I studied classical piano, but in that folk ensemble I played violin, just by ear, without taking any lessons. Mom forced me to improvise, did not allow to play the main melody. I guess that is where the improvisation got fed. Which jazz artists have influenced you? One of the first jazz influences was the Ukrainien a cappella ensemble ManSound. Later on, Wayne Shorter, Chick Corea, Michael and Randy Brecker etc. From singers, probably Billie Holiday, but I haven't listened very much jazz- or pop-singers, not even in childhood. It has a sense of story-telling singer-songwriter touch I guess, because mostly I sing and compose out of my personal reactions. I tell stories of my life through whatever music I play or sing, mine or others, always true, even maybe too naked sometimes. Never tried to copy any singers, never liked too much pop (now I've turned softer as a listener), so maybe it makes my use of voice a bit weird for some people. So they tell me at least. But for me it is just using my voice as usual. But the music itself uses traditional harmonies mostly, long melodic lines, grooves, simple and polyrhythmic mixed. Strong influence of folk, but sounding like jazz to many, because, whatever it is stylistically, it is widely open to improvisation. Can you tell us something about the Estonian jazz scene? It is great for such small country. We have many jazz clubs in Tallinn and also" jazz life" in other cities. 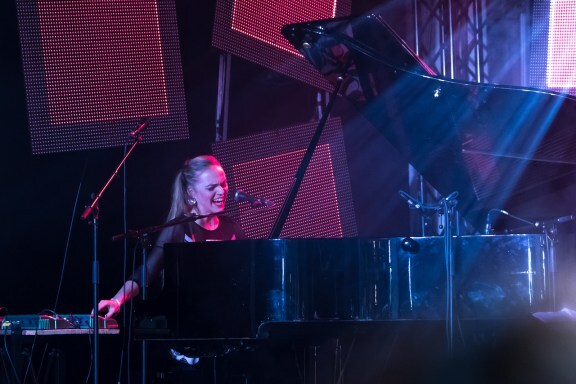 Estonian Jazz Union keeps the jazz clubs alive in 6 different towns in Estonia, organising regularly concerts in addition to all the rest of the organic concert life. Because of Soviet Union times, jazz tradition is not old, so our audience is young and open to all kinds of jazz. It does not know, what to demand from a musician, which gives us freedom to do whatever. I guess that makes Estonian jazz interesting, brave and different maybe. Maybe not to an outsider, who knows? What do you listen for pleasure? All sort of music. Last CD that played at least 5 times in a row in my car, was by Tõnu Kõrvits - "Moorland Elegies" by Estonian Philharmonic Chamber Choir and Chamber Orchestra. You work in music outside of jazz, can you tell us about those areas? I compose for an a cappella group Estonian Voices, where I also sing, so it has lead me a bit into choir composing lately. For instance, this month, my very first large piece, a 45 minute "Giving Myself To The Sea" is performed for the first time with our Grammy Winner Estonian Philharmonic Chamber Choir, where I also sing and play piano as an additional colour. But mainly I sing my own music and create such music as compositions and arrangements for other groups as well. I am active in tens of projects, I guess at least 5 bands of those are giving concerts at the time. Jumping from classical to jazz, pop and folk. Will you be back in the UK in the near future? Yes, I will be back. With Estonian Voices at London’s Kings Place at 24th of January 2018. Probably in April with my own Quartet and Tormis Project for a festival at the Sage maybe, maybe some more. But generally, the calendar is filled with different projects in Estonia and elsewhere. Next year I'll be in Canada, China, France, USA, Russia, Italy, Hungary, Denmark,Germany and probably some more, which I don't know yet. Would love to come back to London with my duo as well, because the audience was so kind and reacted like they would like me to come back. For more information visit Kadri's website.